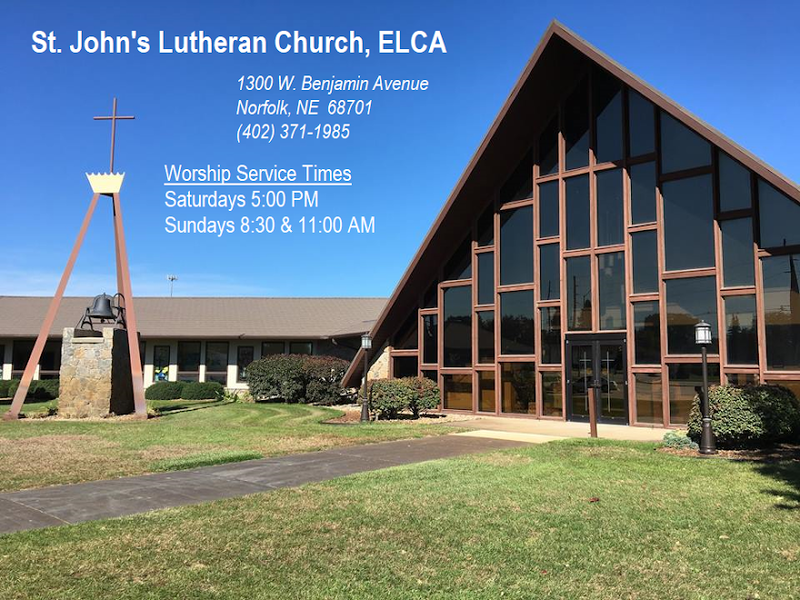 Norfolk, NE (ELCA) – St. John’s Lutheran Church in Norfolk, NE is one of nearly 10,000 congregations of the Evangelical Lutheran Church in America (ELCA) participating in “God’s work. Our hands.” Sunday, Sept. 13, 2015. Across the country, thousands of ELCA members are engaging in service work to make a positive change in their communities, build and deepen relationships and share God’s love. Members of St. John’s will be working on several projects during the day including helping the Rescue Mission with some storm repairs, sizing and labeling clothes at Orphan Grain Train, cleaning up around the library and other locations, assembling school kits for international distribution, random acts of kindness and more. The ELCA is a church deeply rooted in faith and in sharing its passion for making positive changes in the world. St. John’s joins other ELCA congregations across the country to boldly participate in God’s work in the world – restoring and reconciling communities, and pursuing peace and justice. Tracy Meister, Coordinator for St. John’s Day of Service said she is “excited about the day of service because it gives us an opportunity to work together as the hands and feet of Jesus in our community!” Interim Pastor David Cox added that “our community of faith includes all within our community!” More information about the ELCA is available at www.elca.org/dayofservice. The ELCA is one of the largest Christian denominations in the United States, with more than 3.8 million members in nearly 10,000 congregations across the 50 states and in the Caribbean region. Known as the church of “God’s work. Our hands,” the ELCA emphasizes the saving grace of God through faith in Jesus Christ, unity among Christians and service in the world. The ELCA’s roots are in the writings of the German church reformer, Martin Luther. Another VBS is nearly done as tonight we celebrate with continued singing, laughing, and learning about God's love and mighty power to conquer the challenges we face. It has been a very busy week, and we hope you had the opportunity to grow with us! 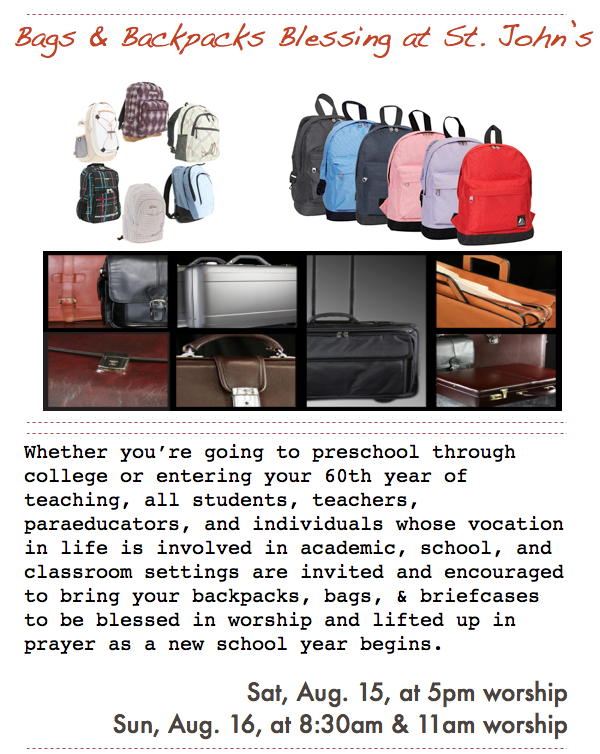 In one week (August 16) we proclaim another Sunday School year OPEN, with Rally Day's Blessings of Backpacks and all those who continue to learn, either as a teacher or a student. Bring your backpacks! Don't rush home after late service (which moves back to 11AM) because you'll not want to miss the BBQ cookoff and pie baking contest. See who wins (or retains) the trophy as Best BBQer! The new Traveling Trivet Trophy will be presented to this year's winning pie baker. Everyone will enjoy the outcome! Lots of games and fun for everyone -- beginning at noon! 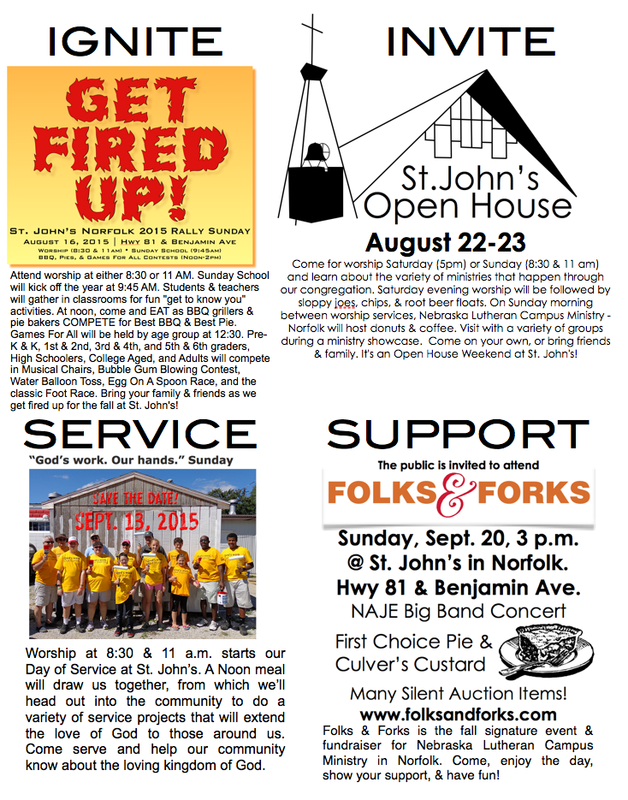 On August 22-23, we invite everyone to visit St. John's for an openhouse. Discover the many ministries that thrive in the community and within the church. Join us for dinner after the Saturday evening 5 PM worship service, served by our Parish Fellowship Team. On Sunday, our Nebraska Lutheran Campus Ministry (NeLCM) will host the coffee hour @ 9:45 AM. Everyone invited!